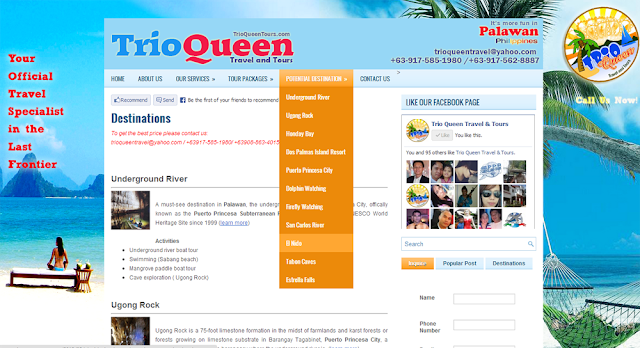 Trio Queen Travel & Tours is an inbound licensed tour agency and operator based in Puerto Princesa City, Palawan, Philippines. We are specially trained, experienced and accredited in handling travel & tour arrangements in all destinations in Puerto Princesa City and Palawan at affordable rates. Our commitment to provide local and international tourists an unforgettable & extraordinary adventure in the last frontier makes us different. We at Trio Queen Travel & Tours are dedicated to make your visit hassle & stress-free. Discover Palawan with us! …and make every penny you spend worth the comfort and satisfaction you get.